AntisocialThe society column for people afraid of society, written by The Root's Editor-in-Chief and resident Bipolar Disorder expert/sufferer. 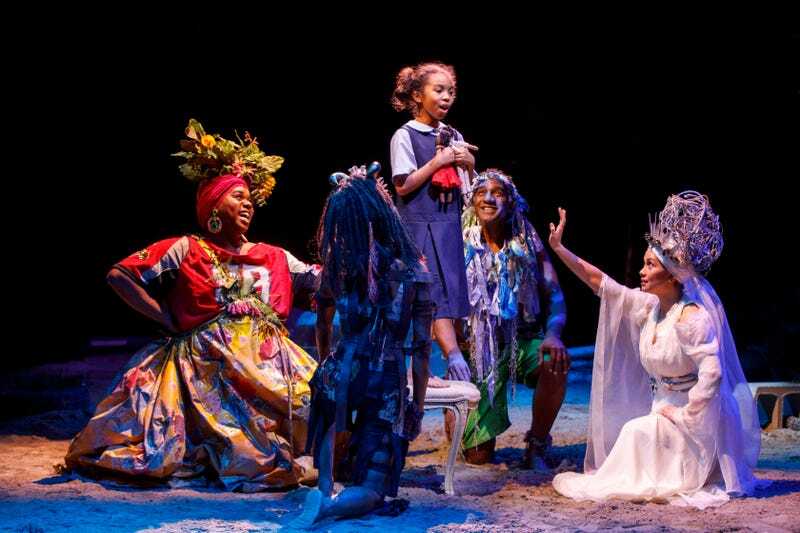 There are probably a few ways to read the wondrous musical Once on This Island, which originally debuted in 1990 and was revived on Broadway in New York City in December 2017. Perhaps it’s a lesson about following your heart against incredible odds. Maybe it’s a tale about the occasional perils of falling in love across class and color lines. But then again, it could be a warning—much like the Hans Christian Andersen story on which the original book was based, The Little Mermaid—that you shouldn’t give up all you have just for a guy you saw for five seconds as he flew past you in a car. Being that I’m over the age of 15 and no longer doodle my name with a boy’s name over and over in a spiral notebook no matter how dynamic or cute he is, I’m inclined to believe the latter. Because I’m a cynic. Because I’ve loved and lost much. As much as the heroine in this fairy tale from the Diaspora? Probably not, but enough to where I have a wary eye for those who idealize the perfect, unrealistic love that is unobtainable. Welcome to Antisocial, the society column for people coping with society, namely those of us with social anxiety disorders. In this column, I’ve tackled almost dying, almost dying some more, really almost dying for real (no jokes) and actually having some amazing experiences while battling my own issues around anxiety. I’m happy to say that with each column I’ve gotten better, thanks to the fact that the more I go out, the easier it gets. Oh, and Wellbutrin. That helps too. I was invited to attend Once on This Island, followed by dinner at Cove Lounge in Harlem, by the folks behind both this amazing show and the deliciousness that is the black-owned and -operated Cove, “the official culinary community partner for the musical.” Naturally, Cove got this gig thanks to its “Caribbean-inspired cuisine,” which I nibbled on with Harlem resident and one of my amazing editors at The Root, Angela Bronner Helm. Angela’s fave dish at Cove is the “award-winning” lobster mac ’n’ cheese, which is as decadent as it is to die for, and was served to us along with the crispy Cove wings and jumbo lump crab cakes with mango salsa that weren’t so bad, either! Unfortunately, because of my sometimes temperamental stomach (thanks, anxiety), I could only enjoy some of the food before my uneasy belly got the best of me. Thankfully, Angela was more than happy to take the mac ’n’ cheese and other tasty bites with her, which she devoured the next day at work for lunch. Now, I first saw this latest production of Once on This Island on opening night in December, back when it featured ol’ Grace Greenleaf herself—Merle Dandridge—as the god of death, Papa Ge. It opened to rave reviews, with many standouts, most especially the show’s star, Hailey Kilgore, who plays the brown-skinned Ti Moune, the young girl who falls in love with a light-skinned boy (Daniel, played by Isaac Powell) from the other, wealthier, resort side of an island located in the French Antilles in the Caribbean. Dandridge has since moved on from the musical and been replaced by another woman playing the originally male role of Papa Ge—Tamyra Gray, a former American Idol contestant who is returning to Broadway for the first time in more than 10 years. I spoke with Gray over the phone a few days after watching her perform as Papa Ge on April 15 at the Circle in the Square Theater. Gray describes the show as a play that reveals “how a community is able to actually introduce change in a [place] where the beliefs are so rigid that the only things they do are if the gods say. There isn’t a moment where they’re thinking for themselves until Ti Moune,” she says, referring to the lead character who sets the play in motion with her desires for a life bigger than the one she’s known. Gray says that Broadway is becoming more diverse; that while she’s been away from its stages for a minute, she’s seen several plays, like Frozen, Carousel and The Band’s Visit, with diverse casts. She praised the current spate of Broadway productions for catering to more than one specific genre. “It’s really hopeful, and I feel as though the more creatives that put shows together that are more inclusive, the more we’re going to see that on Broadway,” she says. But will Broadway ever have its own Black Panther moment, where one piece of art featuring a predominantly black cast dominates the landscape and changes the conversation? “Well, you know, I think it will happen,” Gray says. “When that playwright comes around, they will absolutely put that out. I think the thing that we need to focus on is more shows that are inclusive of all races. The climate of the world right now is so exclusive and divisive that moving forward, we need to include more things that include the whole, that represent the world. That’s the only way we’re going to be able to move forward and stop revisiting these past situations that aren’t getting healed. They’re just being recycled over and over again. And I think the way to do that [is] with a show like Once on This Island that tells you how people come to be. Gray explains that for blacks across the Diaspora, stories like this are important because “when our ancestors were brought here they lost so much of their history. They try to hold on to it as much as they can,” adding that Once on This Island borrows from real Haitian gods and folklore.